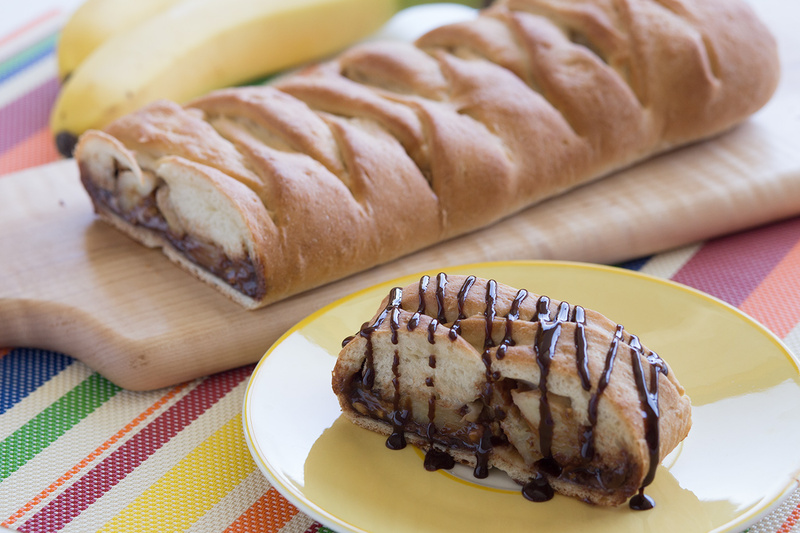 A delicious nutty and sweet braid. Spray counter lightly with cooking spray. Combine rolls and roll into a 12 x 16 inch rectangle. Spread hazelnut spread lengthwise in a 4 inch strip down the center of the dough. Top with peanut butter and bananas. Make cuts 1 1/2 inches apart on long sides of dough to within 1/2 inch of filling. Begin braid by folding top and bottom strips toward filling. Then braid strips left over right, right over left. Finish by pulling last strip over and tucking under braid. Lift braid with both hands and place on a large sprayed baking sheet. Bake at 350 degrees F 20-25 minutes. Remove from oven and let cool slightly. Slice and drizzle with chocolate syrup if desired.